In mid-October 2014, North and South Korea resumed talks at Panmunjom. While the two countries are technically still at war, as they never entered into a truce after the Korean War in 1953. The two countries have proceeded through various discussions and attempts at conflict resolution throughout the years with varying levels of success. The most recent talks occurred in February 2015, when the two states reached an agreement that relatives from either country to meet each other for the first time since the Korean War. Both sides also agreed to tone down the harshness of their rhetoric when speaking about each other. In August 2015, South Korea proposed a new round of talks, hoping for another reunion visit to take place in early September for Chuseok (Korean Thanksgiving). On October 4, 2015, high-ranking North Korean officials came for the closing ceremony of the Asian Games and agreed to resume formal high-level talks. While the talks looked momentarily like they would not proceed after North Korea fired at balloons carrying propaganda against North Korean leader Kim Jong-un, the talks proceeded at Panmunjom anyway. Flag near the village of Panmunjom in the demilitarized zone between North Korea and South Korea. Each set of talks between North and South Korea has increasingly important implications for international law. North Korea still does not officially recognize South Korea as an independent state, but as a part of North Korea. However, each time it treats South Korea as a state, the North weakens the strength of its claims over the South. While North Korea continues to act as if the two are not separate states in some ways (such as refusing to recognize the Northern Limit Line), engaging in high-level talks suggests that it does in fact recognize South Korea’s statehood. This could be a very important step for reconciliation between the two states. These talks could also be interesting to the legal world because they may lead to talks about all conflict disputes and uses of force between the two states over the last several years. Note that neither North nor South Korea has accepted compulsory jurisdiction to the International Court of Justice. Therefore, any dispute resolution must come from the two states themselves or allies acting as intermediaries. 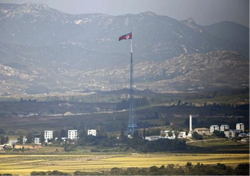 The subject matter of this level of talks may range from the recent border altercations to another reunion between citizens to the lifting of the May 24 Measure, a trade sanction imposed on North Korea by South Korea in 2010. These are topics that could fall within the purview of the ICJ to mediate, but the states have instead decided to work out the consequences and remedies amongst themselves. While history says that jumping to conclusions about the result of these talks would be unwise, as each past set of talks has failed to prevent incidents between the two states, one should not believe that these talks are useless. For each step towards reconciliation, whether that means obeying borders or lifting sanctions, the two countries fall more in line with recognized international law. For a dispute as long as the one between these two states, that is no small feat. Samantha Peaslee is a 3L law student at the University of Denver Sturm College of Law and Senior Managing Editor for the Denver Journal of International Law and Policy. New years day marked the simultaneous 20th anniversary of the famed Zapatista uprising, and the date at which the North American Free Trade Agreement went into effect. On January 1st, a number of Zapatista sympathizers gathered in Mexico and around the world to remember the violent uprising and to bring light to the continuing mission of the Zapatistas and the EZLN. On January 1st, 1994, armed insurgents from the Zapatista Army of National Liberation (EZLN) stormed cities in the Mexican state of Chiapas. Following decades of increasing frustration with land distribution and a growing guerilla population, the EZLN rebelled to protest the overall treatment of indigenous Mexican people, the implementation of NAFTA, and President Salinas de Gortari’s decision to amend Article 27 of the Mexican constitution and allow for the privatization of indigenous lands. NAFTA provisions allowed foreign and domestic private investors to purchase indigenous land. The Zapatistas set out not to overthrow the Mexican government, but primarily to stand against the Institutional Revolutionary Party (PRI), which had held power in Mexico for over 60 years. During the conflict, approximately 3,000 Zapatista supporters burned military buildings and released inmates in San Cristobal de las Casas, a small city in southern Mexico where many political prisoners were being held. Their efforts were met with resistance on January 2nd, when the Mexican Army counterattacked, resulting in in significant casualties. Fighting ended January 12th, when Samuel Ruiz bishop of the Diocese of San Cristóbal de las Casas, Chiapas, acted as a mediator between the EZLN and the PRI, and declared a ceasefire. Although the Zapatista ideology and rebellion began long before the 1994 uprising, the New Years incident is often considered the starting point of the ongoing Zapatista quest for indigenous land rights in Mexico. The Zapatista ideology, Zapatismo, draws from a number of schools including traditional Mayan practices, libertarian socialism, and Marxism. Closely associated with the former National Liberation Forces (FLN,) the EZLN was heavily influenced by a Marxist-Leninist goal of creating an army to resist post 1968 “Cultural Revolution” state forces. Today, many Zapatistas live in independent communities on the land gained during the 1994 rebellion. Called “caracoles,” these communities are independent from local government. Signs warning visitors of the nature of the community line the entrance to each village with sayings like: “You are in Zapatista territory in rebellion: here the people rule and the government must obey.” The schools are lined with murals depicting the rebellion, and the farms are run independently. These small communities remain essentially autonomous from the Mexican government. Despite the implied picturesque notion of small farming communities delighting in total freedom, the Zapatista villages remain in poverty in large part due to their refusal of government aid. 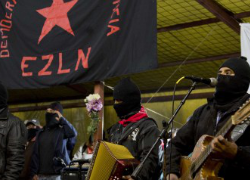 The EZLN movement is still alive today, and although the Zapatistas still remain at war with the Mexican government, the current fight is essentially nonviolent and largely theological. Still retaining the signature black masks, EZLN representatives sporadically appear on local TV and Internet live streams. “The EZLN remains alive, not as a military option, but as a social and political organization that fights for a dignified life,” says Catholic Bishop of San Cristobal de las Casas and long-time Zapatista supporter Felipe Arizmendi. However, support has decreased substantially, in large part due to the prominent indigenous empowerment efforts elsewhere. “They left. Some went faster than others. And the majority of them don’t look at us, or they do so with the same distance and intellectual disdain that they did before the dawn of Jan. 1, 1994,” Zapatista leader Subcomandante Marco said in a recent statement. Additionally, although the Zapatistas are often publicly vocal, the group has received heavy criticism for their abrupt and extended periods of public silence. Although the Mexican constitution was amended in 2001 to protect indigenous rights and lands, discrimination against the rural indigenous population, and a frustration with the effects of NAFTA on the Mexican economy remains widespread. Additionally, with Mexico’s recent approval of a number of energy reforms allowing for foreign oil drilling, many worry that frustrations are reaching a similar level to that of 20 years ago.